Julia Rogers credits her upbringing in Toms River, N.J., for stoking her wanderlust. As she joked in a recent interview, "There's nothing like growing up in suburban New Jersey to make you want to visit exotic, far-flung locations." Rogers, who's now a professional gap-year counselor, helps college-bound high school seniors discover their own wanderlust and find their place in the world. That "place," albeit temporary, may be a conservation sanctuary in Costa Rica that rescues injured macaws; a school in Laos that teaches Buddhist monks how to speak English; a hospital in Cape Town, South Africa, that offers internships to students looking to pursue nursing or medicine; or an icebreaker off Antarctica where researchers study the effects of climate change. A generation ago, a high school senior who delayed college for a year to travel the world was often considered a slacker by family, friends, teachers and college admissions counselors. Today, the practice of taking a gap year — or a precollege sabbatical in order to work, travel or study abroad or in a different environment — has exploded in popularity. In May 2016, then-president Barack Obama's daughter Malia announced that she was taking a gap year before attending Harvard University. At the time, National Public Radio reported that about 40,000 American students were taking gap years. 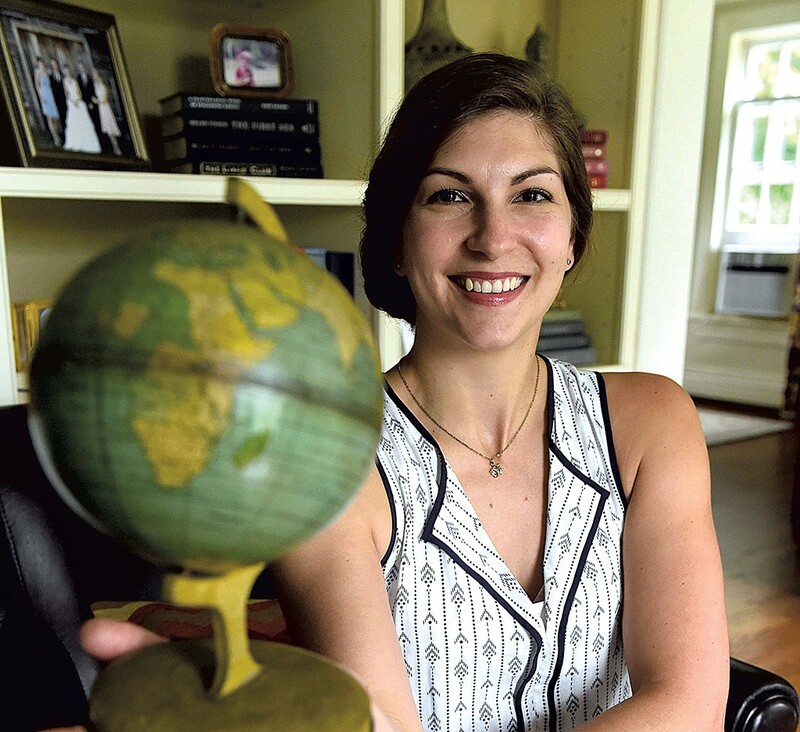 Though the 34-year-old Stowe woman never took a gap year herself, after graduating from Hamilton College in 2006, Rogers spent 10 months in Tanzania working for a nongovernmental organization that focused on HIV and AIDS prevention. As she discovered, all of the program participants were students or recent graduates ages 18 to 24, half of whom were on gap years from the United Kingdom, where the concept originated. "I got to see these 18-year-olds mature so profoundly over the course of my time there and thought, I wish I had done that before college," Rogers recalled. "It would have changed everything about my college education." In October 2008, Rogers founded EnRoute Consulting to help high school students navigate the logistical complexities of planning a gap year. Last month, she became the first such counselor in the United States to be accredited by the nonprofit Gap Year Association, an industry trade group. Among the biggest changes Rogers has seen regarding gap-year programs is their acceptance by colleges and universities. Many institutions of higher learning, including Harvard and Vermont's Middlebury College, not only tolerate six-month to one-year deferrals but encourage admitted first-year students to take them. Why? As Rogers explained, students who've taken a gap year arrive on campus more mature, relaxed and civically engaged in student life. And they often perform better academically than their peers. SEVEN DAYS: Explain how taking a gap year benefits students. JULIA ROGERS: There are a lot of ways that a gap year can be beneficial to different types of learners. For students who are the higher academic types and headed to elite colleges, those kids can be burned out, having just been through a pressure-cooker high school experience that often makes them anxious, and their capacity and desire to learn has decreased. For those kids, taking time out to learn in experiential ways can be very beneficial. For students who are more experiential learners who just don't like the classroom environment, a gap year allows them to tinker and explore in a way that's more comfortable for their learning style, and often gives them clues about what they might want to study in college, what they're good at and really boost their confidence. Then there are kids who've had some trauma or depression, [for whom] it's good to just take some time off. Finally, many students don't want to go into debt before they know what they want to study. SD: Do you primarily help students looking to travel overseas? JR: The biggest thing about gap time is not necessarily that it's abroad, just that it's away from where you grew up. It has to be different in some way, especially when it's away from the culture you grew up in. I like to take a Vermont student and throw them into Texas or a large city and show them how other Americans live. That challenge and change of scenery helps them grow. SD: What kind of guidance do you offer? JR: A lot of it has to do with organizing everyone's thoughts. A student may know they want to take a gap year but [be] totally overwhelmed, especially [when just] coming out of the college application process. What I bring to the table is some structural organization to the planning process, and the ability to assess a student and help them plot out some of their personal goals, their geographic parameters and their budget, and then produce a menu of options tailored to their needs. On the back end, I'm also vetting programs and evaluating them for quality, safety and type of experience. SD: What are common concerns you hear from clients? JR: For parents, a lot of it is about safety and cost. They want to know their child will be safe and what's the bottom line on this experience. The ironic thing is, people in general are pretty bad at assessing the risk of, say, sending an 18-year-old to college in a big city in the United States versus sending them to a small village in Guatemala and which one is going to be safer. The same with cost. Some families are willing and able to invest a lot into gap time. But there are ways of doing a gap year for little or no money, or [offsetting] the cost with scholarships or by working for part of the year. SD: What does a gap year typically cost? JR: It varies, but if you're going abroad, most families spend between $10,000 and $20,000. But people can go over that or under that. There are everything from formal programs that are mentored and guide students through intensive learning, which are more expensive, to work-exchange programs such as WWOOF — or worldwide opportunities on organic farms. SD: What are some common misconceptions about gap years? JR: Parents used to be worried that if a student took a gap year, they wouldn't want to start college later. There's plenty of data debunking that myth [showing] that 90 percent of students start college within a year of taking a gap year. Anecdotally, all the students I work with who intended to go to college beforehand know that that's a valuable experience and still want to go. They just want to have this experience first. SD: Are there places you just won't send students? JR: Definitely. Any [country] that's on the State Department's "Don't go, you'll get kidnapped by pirates" [list]. For instance, this year Nicaragua is off my list. I like Mexico a lot, too, but the Cancun area ... is a bit sketchy right now. Beyond that, there are different comfort levels for families. One of my students really wanted to join the armed forces, and he thought it would be wise to take a gap year and become fluent in Arabic, which I thought was admirable. But he wanted to go to every dangerous place in the Middle East. So I constantly checked his aspirations. He ended up going to Amman, Jordan, which was our happy compromise. SD: Do you ever hear criticism that gap years primarily benefit affluent students? JR: Yes. Right now the market is meeting [the needs] of those who are taking a gap year. But a lot of people also don't know that you can take a gap year for less money. It used to be, a generation ago, that college was a privilege [for the wealthy]. And then we decided as a culture to create access for more people to have a college experience if they wanted it. I think that's where the gap-year industry is going right now, to create scholarships and financial aid. SD: Are there benefits to staying in one place for the entire gap year versus traveling to several countries? JR: I think both are valid. It depends on the person and their individual goals. Trying a lot of different things is really good for students who have no idea what they want to study or do for a career. Every different gap-year experience gives them information, not necessarily that "I was in the Amazon, so now I know I want to be a field scientist." It's not always that direct. Sometimes, it's "I had to stand up in front of a group of people and teach something, and I really enjoyed that. Maybe I'll teach English next and go into education." The biggest benefit to sticking in one place and having one immersive experience is learning a language and becoming part of a community ... I worked with a student from Stowe who was in Bali for eight months. Not only did it have an obvious impact on her, working there for that long, but she also discovered her love of teaching and switched around her major to that end. The original print version of this article was headlined "Minding the Gap"